Project: Sonoma County Farm Bureau and their members were being threatened as an initiative was placed on the ballot by the Occidental Art and Ecology Center and GE (Genetically Engineered) Free Sonoma County. The initiative’s goal was to ban anything from being grown or cultivated that was genetically modified or had products containing Genetically Modified Organisms. No clear exemptions were made for vaccines or other medical procedures. However, exemptions were made for the importation of food, including animal feed, that were made using genetically modified crops – this exception would put Sonoma County farmers at a major disadvantage. Further, any future grape vines that could be produced using Genetically Modified Organisms would also be banned – preventing the Sonoma County Wine Industry to use future vines that may be created to be resistant to Pierce’s Disease or other such diseases. Challenge: The issue was split amongst Sonoma County voters. Funding was difficult to come by and the proponents were already defining the issue using scare tactics and environmental groups to assist in putting out their messages to voters. Many of the public opinion leaders were convinced that an initiative such as a ban on Genetically Modified Organisms (GMOs) would surely pass in a County such as Sonoma. Strategy & Execution: Sonoma County Farm Bureau retained MPA to provide a strategy and implement a campaign plan. This plan incorporated coalition building, research, direct mail, electronic (radio and television) media production and placement and print media. 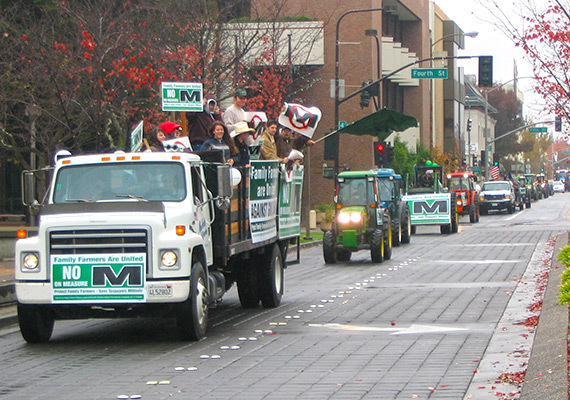 MPA created an entity calling itself “Family Farmers Alliance” (of course an arm of Sonoma County Farm Bureau) with a message that Family Farmers are united against the initiative (Measure M) banning GMO’s and by claiming that a ban on GMO’s would be bad for local farmers and ranchers. They also claimed that the initiative would also ban vaccines for their livestock but for our children and seniors as well. Outcome: MPA was successful in fighting Measure M. 54%-opposed to 46%-support.